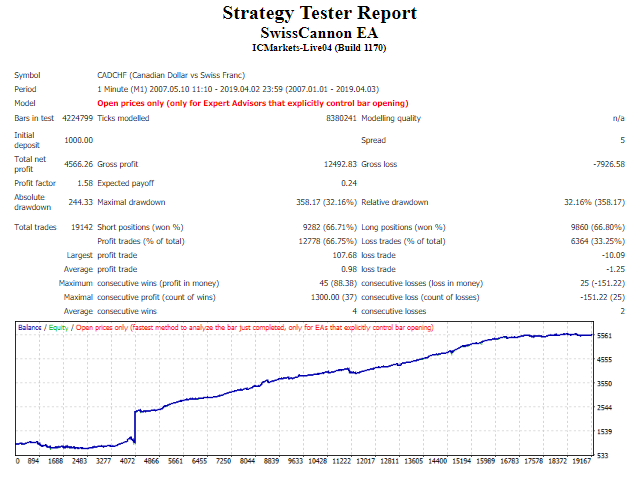 SwissCannon EA is an advanced type of mean-reversion scalper that trades for 6 hours each night 5 days a week. It has 4 built-in core set files and is already fully optimized for multi-currency pairs trading. The core strategy logic is based on the concept of finding the highest peaks in price action on the 1 minute bar. Momentum is filtered out for optimal mean-reversion. Exit mechanism is dynamical and stop losses are always used for every trade (set at 100 pips). This system does not use hedging, martingale, grids, or other similar toxic methods of trading. 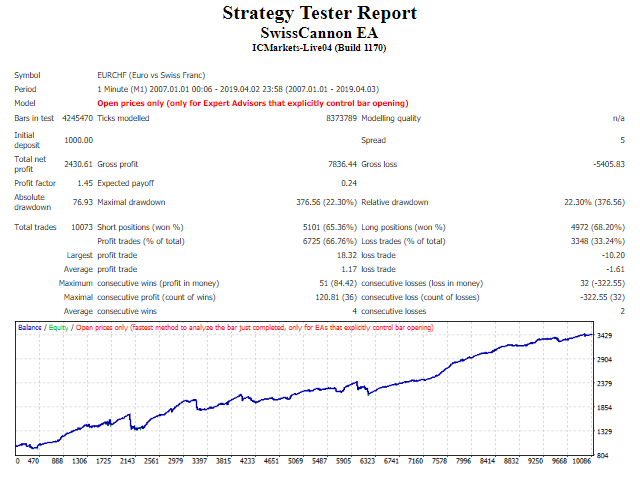 The system was developed primarily for EURCHF but the following pairs can also be used: CADCHF, CHFJPY, EURGBP, GBPCHF, and NZDCHF, on the M1 timeframe. MagicNumber - Must be an integer i.e. "222"
TradeComment - To add to EA Comment i.e. "SWISSCANNON"
ShowPanel - Set to true to show panel information on the chart. Fixed some of the code on order timing.